We provide repairs to almost all manufacturer's floor machines. Drop-off and on-site repairs are provided. 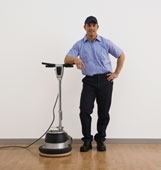 We can service all sizes of floor machines - contact us today for a quote or for on-site service and repair. Need service for your floor machine, air mover, carpet extractor or floor burnisher? Call or email us for information on a service tech visiting your facility. Intra-city Supply Co. is a janitorial and sanitary maintenance company specializing in the repair and sales of commercial vacuums and floor machines. We provide electrical motor repairs, pump repairs, and electrical diagnostics. In addition to repairing battery, plug-in, and propane powered floor machines, we also offer sales of new and used equipment, rentals, on-site repair services, and pick-up and delivery service. The major focus of our business is service and repair, although as your equipment ages, it is no longer cost-effective to have your older equipment repaired, we offer excellent prices on new and used machines, such as buffers, wet-dry vacs, carpet dryers, and carpet extractors. We also sell the accessories and chemical products needed to keep your equipment running smoothly and efficiently. An on-site service call is normally $90-$100, although we do service calls in greater New Bedford for only $65.00/hr.